KappaElastin™, Anti-Wrinkle and Anti-Aging elastin pentapeptide. Facial rejuvenation without injections. KappaElastin is the scientific response to skin aging. a real breakthrough in scientific cosmetics"
As we we age, our body stops producing elastin. The skin starts sagging, allowing lines, folds and wrinkles to appear. 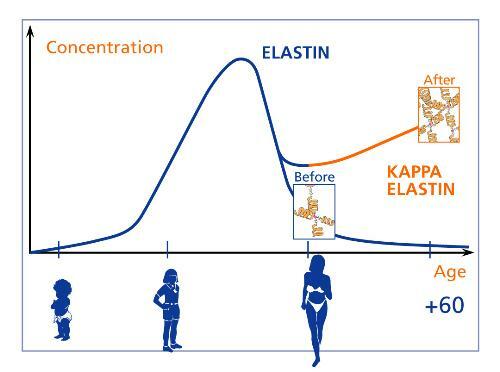 This is the reason why KappaElastin is of the utmost importance in dermo-cosmetology as it compensates for the loss of elastin in our skin. Developed by medical researchers at the CNRS, a major European University Research Center, KappaElastin -a pentapeptide of pure elastin- is a real anti-aging molecule with in-depth action allowing our skin to rebuild its natural elastic tissue, and regain a much more youthful appearance. We invite you to learn more about our skin-care solutions. We offer an entire Integral Skin Care Program based entirely on the beneficial and unique properties of KappaElastin, the Elastin PentaPeptides. KappaElastin is under international patent protection and was registered with the Food and Drug Administration in the USA as early as 1991. No Risk. Start Regenerating Your Elastin with complete peace of mind and our 100% satisfaction guarantee: no-question-asked 30 day money back guarantee. KappaElastin was clinically proven to reduce the appearance of wrinkles. Discover the Answer To Younger Looking Skin. See a significant reduction in the appearance of fine lines and wrinkles without painful injections or health risks. KappaElastin is a newly patented elastin molecule which increases your elastin level, tightens your skin and replenish its moisture level. KappaElastin Anti-Aging Dermo-Cosmetic Skin Care Products. The most effective, powerful and proven substance for reducing facial wrinkles known to science. Recommended by Dermatologists in Europe for most elastin deprived skins of over 40 of age. All four skin tone groups and all skin types: dry, oily, normal or a mix. Non Surgical Face Lift Treatment: Our Repair Gel in the morning and the evening combined with your usual day and night creams for four weeks and look 10 years younger! KappaElastin repairs stretch marks and is now clinically proven to reduce fine lines, wrinkles and crows feet. No need for Facial Peels, Surgical Eye Lifts or Face Lifts with KappaElastin Anti-Aging and Anti-Wrinkle Products. No shots, no injections, no abrasions, no surgery. The biotechnology of the skin's natural healing process has arrived with the first tissue repairing complex containing growth factors found in normal, healthy skin. KappaElastin, a medical research based cosmetic ingredient only found in our products, is made of soluble elastin proteins that restores what time took away. KappaElastin DermoCosmetics: A non surgical facelift. Getting older is inevitable. Fight the physical effects of aging with KappaElastin Dermo-Cosmetics. In a few weeks you can bring back the youthful-looking face you once knew. This easy procedure starts working immediately to lift, tone and bring elasticity back to sagging and wrinkled skin. KappaElastin gently tightens and tones your facial and neck skin. You should see and feel results after the first application. Apply gently upward and outward over the face and neck. We know the incredible results you will see with the KappaElastin skin care product so we are making it risk-free to you with our 30 day money back guarantee. You will see results after only a few uses and you will be thanking yourself for having tried KappaElastin. KappaElastin skin care products are based on a unique soluble elastin molecule that restores skin to its most vibrant and most glowing appearance. Wrinkles and lines will disappear and your young, vibrant skin will return. We have had an overwhelming response to our products. Protect, nurture and cleanse with our amazing skin care system. This refreshing, sensual experience will keep your skin healthy and youthful. Wake up each morning to the gentle nutrients of our revitalizing Repair Gel and then moisturize and protect your skin with a touch of your day cream. KappaElastin Dermo-Cosmetics have been clinically proven to diminish wrinkles, erase lines and keep your skin as smooth as silk. You do not have to spend thousands for your dream looks. KappaElastin offers you "the age-defying facelift in a jar". * Botox®, is a registered trademark of Allergan, Inc.